So, it finally hit me. That awful disgusting cold that is unavoidable as a teacher. It started as sore throat, then the sniffling, then the sneezing started. Gross. You know the feeling, right? I hate not feeling 100% because as teachers, we have to be 100% 100% of the time or the kids just fall apart. And then I fall apart even more. And then I feel like crying. And then the kids really do start crying because I am being so mean and grouchy. And I just want to go home and put my jammies on. I debated last night weather I should call in today. However…..as you may know, “calling in” is not so simple. The hubby tried to talk me into it, but I knew that would mean staying up for hours and hours writing insanely detailed sub plans (that may or may not be followed). One time I had a guest teacher color with the kids all day. COLOR! Alllllllll day! How is that even possible…?!?! And it would also mean going in to school at 4 in the morning to prep and put out everything. Anyways, I told the hubby, I wish (at that moment in time) I had a job where it wasn’t such a hassle to call in. He said yes, but every job is like that……!!?!?!?!? What!?!?!?!?! I don’t think so. Now, before I dropped kicked him, I counted to ten to calm myself down and asked him WHAT other job is like that!? Now, I’m sure there are jobs out there that take as much prep (maybe even more, I don’t know) as teachers to be out for the day, but I couldn’t think of any. And he couldn’t either. So there, I win. Wouldn't it be great if it was like in college... we could just tape a piece of paper on the door that says 'Class Cancelled' and then the kids would just go home for the day. I toughed it out today and the kids and I had a good day. Although I did still just want to go home and put my jammies on. (I kinda want that everyday…). I definitely have a sub tub (love you Pinterest!) and I show my kids and teaching neighbor where it’s at…just in case. Better safe than sorry, right? Some of my friends say I am obsessively overly organized. I like to think of it as a gift. I found some amazing plans to put in my sub binder in case I can’t, for some reason, come in and prep anything. They were created by Rachel at Sub Hub and they're called Emergency Sub Plans. They’re free too!!! 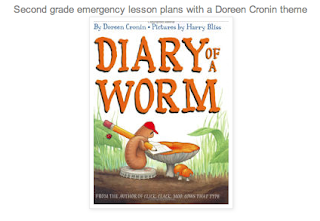 She has them for grades K-5 and they are super amazing. 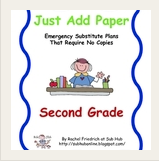 She also has plans for grades K-5 called “Just Add Paper” and they are plans that only require paper. Brilliant! These are on TpT. It just makes me so happy to know if I can’t make it in, there’s at least something there for the guest teacher and the kids. Rachel- if you’re out there reading this- THANK YOU!!! If you know of any other great guest teacher resources, pretty please share! Not sure why the font is going all crazy on this post...??? If it's bothering you, I'm sorry. It's bothering me too!!! Thanks so much for the link to the Sub Hub blog! 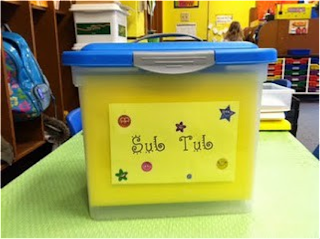 I had a sub tub of activities for I taught third grade, this is my first year in second, and they aren't really appropriate for my second graders! Cute blog. I hope you feel better soon. I am passing the versatile blogger award to you. Check it out over on my blog. I'm your newest follower. Great resources, thanks for sharing! so glad I found your blog, I'm your newest follower! I hope an award will make you feel better. Come check out my page to see the rules for this award. I LOVE the blog you shared and I agree getting ready for a sub MAKES me sick! I had a sub that was a magician and let the kids take off their shoes and socks and jump off the tables!!! We also have had a few subs at our school that wrote on the Smartboard with a sharpie!!!! !